RICHARDS TRAM BLOG: Beijing I have recently been on a visit to China and Pyongyang, DPRK, which was very interesting and enjoyable. Most people are aware I am not a trolleybus fan, but had to hide my scruples on this holiday - and they can be useful when air-conditioned (the temperature was 34 degrees C) and going in the right direction. IPSWICH BUS BLOG: IPSWICH BUS STORY IN VIEW 1950-70 Another slightly different blog that this time charts the progress off the Ipswich fleet through photographs the first picture illustrates the first Ipswich motor bus No 1 ADX 1 an AEC Regent III/Park Royal on the 1B to Maidenhall during the 1960's in what is now the Crown Street Lay by. FOCUS TRANSPORT: NEW HYBRID BUS CHARGING TECHNOLOGY TRIAL ANNOUNCED FOR LONDON The Alexander Dennis Enviro400H E400 buses will be fitted with special technology enabling on-board batteries to receive a charge boost at bus stands at either end of the route. RICHARDS TRAM BLOG: DALIAN NEW LRV EXTENSION ROUTE 202 We caught tram 202 to the end of the route to try and find the LRV and were turned off the tram a few stops from the end of the route. We caught a local bus which follows the route as far as the depot and then turned off into an area of new 'posh' housing. FYLDE BUS BLOG: Lytham Hall Running Day Sunday 31 August saw the first Ribble Vehicle Preservation Trust rally and running day at Lytham Hall. Two passenger services ran, Ribble PD3 1775 and Olympian 2101 operated a Park and Ride shuttle service from the Hall Gates to the Hall itself. BRITISH BUS BUGLE: City-not-so-Smart Edinburgh has launched its Citysmart card in a blaze of publicity, trumpeting it as the Scottish capital's version of Oyster. Citysmart is not valid on the buses of operators other than Lothian and also cannot be used on trains. So while it is a step forward, it's a bit misleading to call it an Oyster equivalent. HUMBER TRANSPORT: Noddle Hill Weekend Reductions; Early Morning Improvements Starting today, Monday 1st September, Stagecoach have introduced changes to services 32 and 52 which serve Noddle Hill Way in Bransholme, as part of their package of changes across Hull. PUBLIC TRANSPORT EXPERIENCE: Three Options for a Funeral  Episode 2 : "A bus, a bus, we're searching for a bus" Some of our readers will now be screaming, "Why didn't the idiot use a journey planner in the first place?" The answer is simple; journey planners cannot be trusted without a measure of corroboration. Remember that Traveline delivers the answers that the programers think are best, not necessarily the options that fbb or chum David might choose. FOCUS TRANSPORT: Merseytravel 30 Year Plan Merseytravel has revealed its plans for the rail network over the next 30 years, which includes "investigating the potential" for a new central stop. 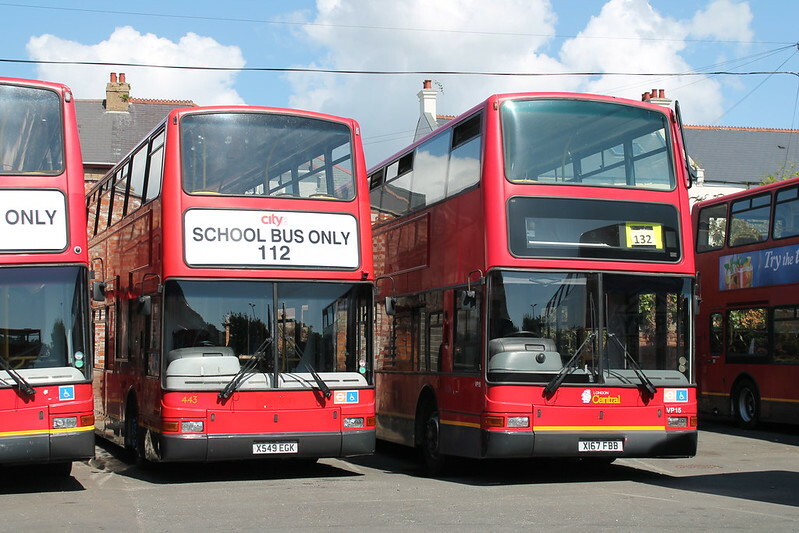 449, Y731TGH was branded for School service 101, and is now at Chambers. It seems all the school buses were very temporary. They're either now driver trainers for a few of them or have left the fleet. The VP class ones with FBB registrations never entered service. All have definitely left now (or are trainers) - there were none sitting around the Lower Yard/back of the tramshed the last few days. They must have been brought down for a reason so does anyone know why they were very shortlived here?.Are there any plans for replacing them,and if so what with?.